We’re seeing a slowing adoption of an online presence of a lot of brick and mortar retailers. 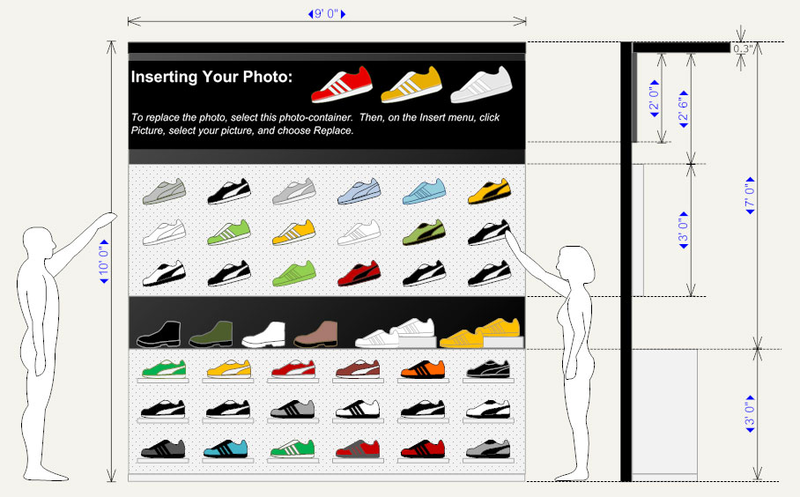 To the untrained eye, it might seem like a no brainer to have an web component. However, maybe it’s that the numbers that don’t make sense — or are brick and mortars optimized to take advantage of human psychology, and that doesn’t translate to online? 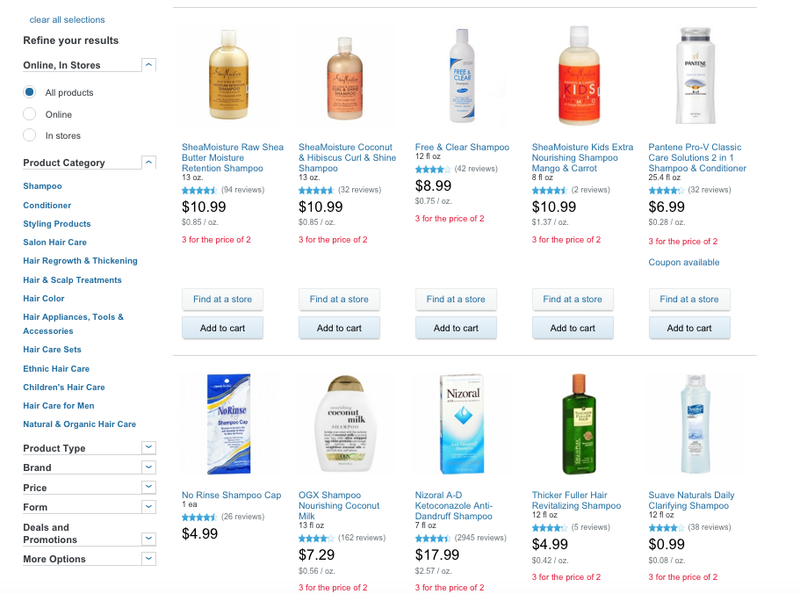 Above is a search on the term “shampoo” on the Walgreens website. It looks a lot different from the in store experience (below). On the website, the price is almost as half the size of the actual product, where in store it’s about an 1/8th. On the website, you can sort by price, name, newest arrival, etc. In stores, there is no sort. You see what the Planogramists want you to see. We had covered planogrammy before but it is the study of placement to optimize transaction frequency and size. 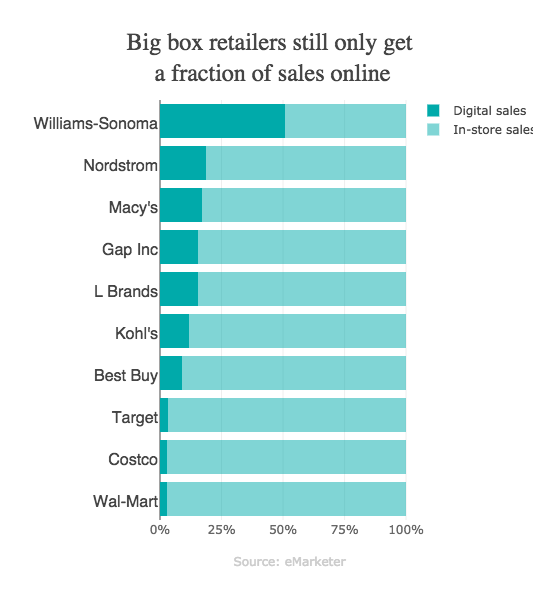 As we had written before, digital sales for big box stores are severely lacking. William-Sonoma is the only retailer that is at 50% on vs offline sales. In second place is Nordstrom with a sub 25% online share. The biggest retailer in the world, Wal-Mart, has a sub 3% online share of it’s revenues compare to overall revenues. 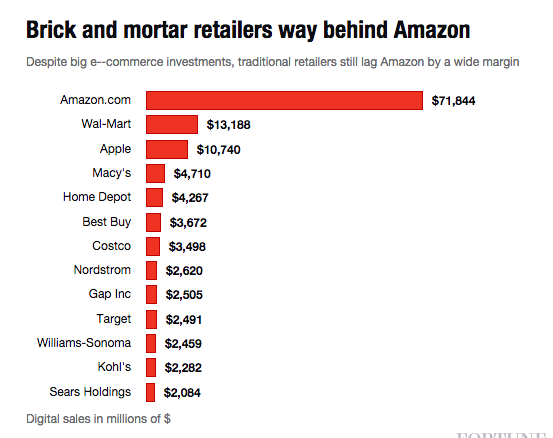 Perhaps it’s the threat of Amazon and big box stores don’t want to compete with it on it’s own turf — the Internet. The reason why the big boxes ignored e-commerce for so long was simply because it wasn’t worth it. The vast majority of sales still take place at physical stores, but e-commerce has reached a tipping point where retailers have realized it’s beneficial to invest and grow sales in the space. 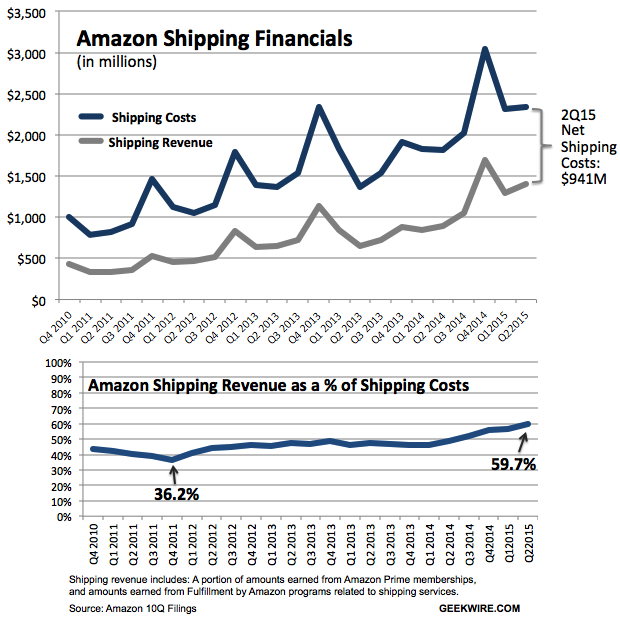 Amazon spent $6.6 billion on shipping costs in 2014, while it collected just $3.1 billion in shipping fees. Amazon cited increased shipping costs, including fuel and transportation expenses, as one of the main reasons for its decision to boost the annual Prime subscription fee from $79 to $99 starting last year. Brick-and-mortar retailers can offer in-store pickup thanks to their physical locations, an option 19% of Internet shoppers have used. Wal-Mart CEO said that shoppers who order groceries online and pick them up in stores spend 50% more money than those who make purchases in-store. 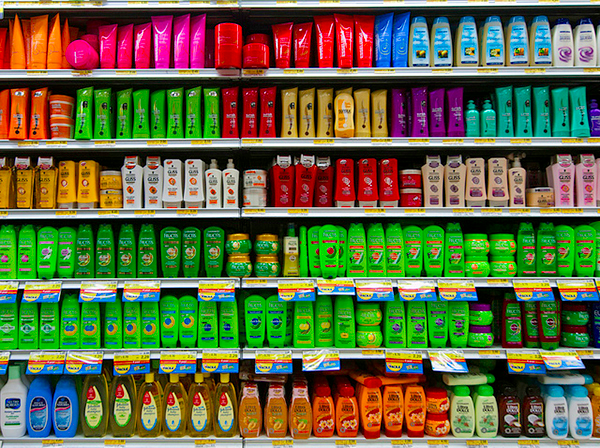 Walmart stores are also largely equipped to handle in-store pickup of online orders. Similarly, “showrooming,” the practicing of browsing in a store, and buying online was supposed to seal the fate of the big boxes. Now, it seems that “webrooming,” or browsing online but buying in the store, has become popular as an Accenture survey said that 78% of respondents they had “webroomed,” while just 72% had showroomed. Costco sells 60 million of those birds every year, keeping the price at $4.99 despite surging costs for both poultry itself and chicken feed. Obviously, it could take in tens of millions dollars more in profits by raising prices on the chickens, which many would see as bargains even if they were $1 or so more expensive. So what’s holding Costco back? By maintaining bargain prices on rotisserie chickens, Costco exponentially increases foot traffic in stores. It also helps shoppers justify the cost of their annual memberships. And, while the hungry shopper is swinging by for a quick, cheap bite or because it’s 5 p.m. and he needs to grab a $4.99 chicken for the family dinner that night, he just might be tempted on the spur of the moment into buying a new TV, or grass seed, or vitamins, or a coffee maker, or any number of other items lining Costco’s aisles. What works for Amazon, might not work for all big box stores. Having the ability to have everyone in the world as a potential customer might work if you have all the factors figured out: shipping costs, acquisition and retention costs, and the right offering. At this point, certain retailers have to rethink if Amazon is a direct or indirect competitor considering how differently they are playing the game. Seamless — The Final Frontier?